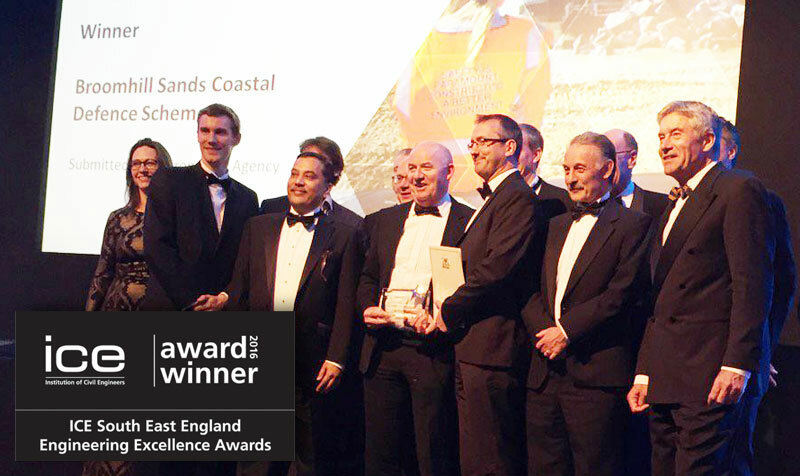 The highly-acclaimed Broomhill Sands Coastal Defence Scheme has been named recipient of yet another prestigious industry award – the Brassey Award (Kent & East Sussex) for Engineering Excellence which was presented at the recent ICE South East England Awards Ceremony. The Brassey Award winner is selected from the shortlisted entries for the ICE South East England Awards. The award is given to the project deemed by the judging panel to be the best example of engineering excellence in the ICE Kent & East Sussex branch area. The scheme included a number of innovations, many of which are ‘firsts’ for the UK and some even for the construction industry. The team also delivered more than £8.9m of efficiencies. The scheme was so successful that it was highlighted in a Cabinet briefing as an example of best practice regarding value and the delivery of large efficiencies during construction. Suzanne Moroney, Director of ICE South East England, said: “We all know the importance of flood defence schemes to local communities. They protect homes, businesses and local economies ensuring residents can get on with their lives without disruption or damage to their property. “The Broomhill Sands Coastal Defence Scheme is an exemplar of a successful, innovative coastal flood defence scheme, using the latest construction methods to provide protection to the region while delivering efficiency savings. “The team should be incredibly proud of themselves. It is an achievement to win one award, but to win two is a truly significant accomplishment”.